Born December 14, 1783, Turku. Died January 23, 1868, Helsinki. Master of Philosophy, Royal Academy of Turku, 1804; Undergraduate, University of Uppsala, 1806-1807. Fredrik Pipping’s most notable achievements were in the field of librarianship. His predecessor had worked intensively to develop the library, practically regarding it as his own. Pipping was like-minded. But arguably the biggest challenge to Pipping’s career so far came on September 4th, 1827, when a fire broke out in the burgher Carl Gustav Hellman’s house in Turku. The fire spread and was to engulf a large part of the town, including the library collections and Academy premises. Only books that happened to be out on loan were saved from the blaze. These now form the Aboica collection. Having moved to Helsinki, Pipping devoted a great deal of time to building up and organising the library holdings. There was plenty to do and Pipping was assisted by his sons. In 1837 he was requested to step down from his professorial chair and turn his full attention to library matters. After the fire the collections in the badly damaged university library were gradually augmented, also from abroad, including in the form of donations from Russia. 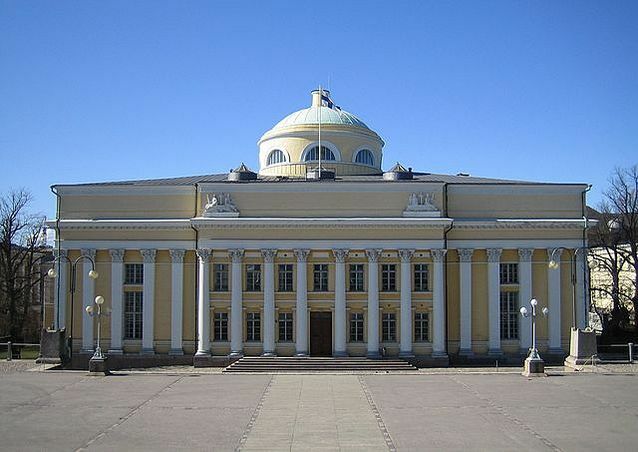 By the 1850s the number of volumes held by the library had overtaken those of the library in Turku. In comparison with the present day however, the library’s activity may appear a little odd, because for example the books were arranged according to physical proportions rather than subject discipline. The practice had begun to change in Pipping’s time, but he represented older users with their established habits. In his book De bibliotheca ordinanda (’On the subject of the ordered library’), he declared that a library organised according to size was easier to use. This was to be his downfall, because a disagreement with the consistorium, the executive body of the University, over the organisational principles of the library eventually led to Pipping’s dismissal. He nevertheless continued work in the library on a voluntary basis. As for the ordering of the collections, the only exception was to be the Fennica collection. This collection is the basis for the present-day National Library’s collections, but in Pipping’s day it was in its infancy. Works on Finnish matter were collected for the collection and it was arranged separately from the other collections. For Pipping, like his predecessor H. G. Porthan, the Fennica collection was of great importance, and he further developed it, gathering knowledge about the earlier literature of Finland, as well as acquiring new books. Of invaluable assistance in this work was Matti Pohto, who travelled around the country in search of potential acquisitions. And based on the information gathered, Pipping published a catalogue of books written in Finnish, which gave details of some 5,000 titles. He was to publish posthumously writings on Finnish literary history. Tuija Laine, ”Pipping, Fredrik Wilhelm”. National Biography of Finland online. Accessed May 7, 2015. Wikipedia, ”Fredrik Wilhelm Pipping”. Accessed May 7, 2015. National Library of Finland, Fennica collection. Accessed May 7, 2015. National Library of Finland, Aboica collection. Accessed May 7, 2015. By Written by Tero Juutalainen. Translated by John Calton.